Yes, you read that right. Chocolate-dipped. Beer marshmallows. Oh, and they have a little crushed pretzel for a garnish. Want one? You probably saw the images of those beer-and-pretzel marshmallows from Chicago chocolatier Truffle Truffle making rounds in the blogosphere a few weeks ago. We saw them and immediately got to scheming how we could make some for ourselves. Making them ourselves proved to be something of a challenge. To get a real beer flavor in the marshmallows, we decided to use a rich chocolate-y stout, let it go flat to get all the bubbles out, and then add it to both the marshmallow bloom and the sugar syrup. You could substitute any favorite beer in place of the stout, though we'd stay with something malty. Pale ales and IPAs would tend to make the marshmallows taste bitter (unless you're into that!). One last note before we move on to the recipe: this makes a half-batch of marshmallows, but the recipe is easily doubled. For the half batch, we found that a standard 8.5" x 4.5" loaf pan worked perfectly as the mold. You can also use an 8" x 8" baking dish, but the marshmallows will be more flat. To flatten the beer, open the bottle and let it sit overnight. If you're in a rush, pour it into a bowl and stir the beer with a whisk to release as much of the carbon dioxide as possible. Spray one standard bread loaf pan (8.5" x 4.5" or close) with nonstick spray or line it with parchment paper and then spray with nonstick coating. If using parchment, tape the flaps to the outside of the pan so the paper stays in place when you spoon in the marshmallow. For the bloom, sprinkle the gelatin in the bowl of a stand mixer. Mix the vanilla and flattened beer, and pour this over the gelatin. Whisk until no lumps remain. Set the bowl back into your mixer and fit the mixer with a whisk attachment. With the mixer on low speed, carefully pour the sugar syrup down the side of the bowl into the gelatin bloom. Turn the mixer to high once all the syrup has been added and let it whip for 8-10 minutes, until it looks like glossy meringue and is very thick. Pour the marshmallow into the loaf pan and let it cure, uncovered, for 10-12 hours or overnight. When the marshmallows are cured, rub the top with a little powdered sugar and turn the marshmallows out onto a cutting board. Rub the top with more powdered sugar. Cut into 18-22 squares of equal size. Melt or temper the chocolate either over a double-boiler or in 30-second bursts on HIGH in the microwave, stirring between each burst until the chocolate is melted. If the chocolate seems too thick, whisk in the canola oil one teaspoon at a time until the chocolate is thin enough to coat. Coat each marshmallow entirely and set them on a piece of wax paper to dry. We use a dinner fork and a chop stick to help turn the marshmallows in the chocolate and slide them onto the wax paper. While the chocolate is still wet, sprinkle the tops of the marshmallows with crushed pretzels. The chocolate might have difficulty setting up if the weather is very humid; try putting the marshmallows in the fridge to help things along. Marshmallows will keep in a covered container for several weeks. In the summer, store in the refrigerator to prevent the chocolate from melting. 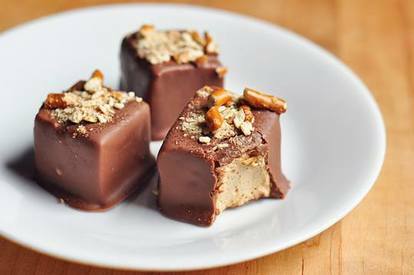 • We prefer the taste of milk chocolate with these beer marshmallows, but you can certainly use dark, semi-sweet, or bitter-sweet chocolate if you prefer. • Instead of coating the marshmallow entirely, try dipping one side in chocolate and the other in crushed pretzels. You can also roll the marshmallows in crushed pretzels alone (though skip sprinkling them with powdered sugar when you cut them into pieces; just use crushed pretzels instead).